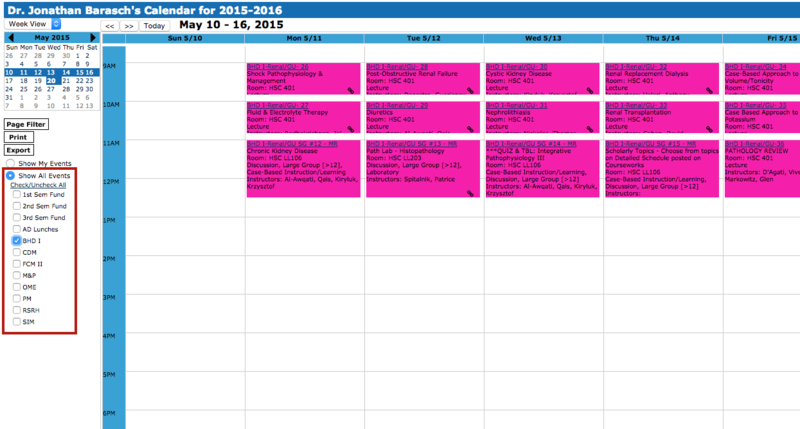 OASIS houses the course calendars for all of the Fundamentals courses and other non-curricular events, such as Advisory Dean Lunches. 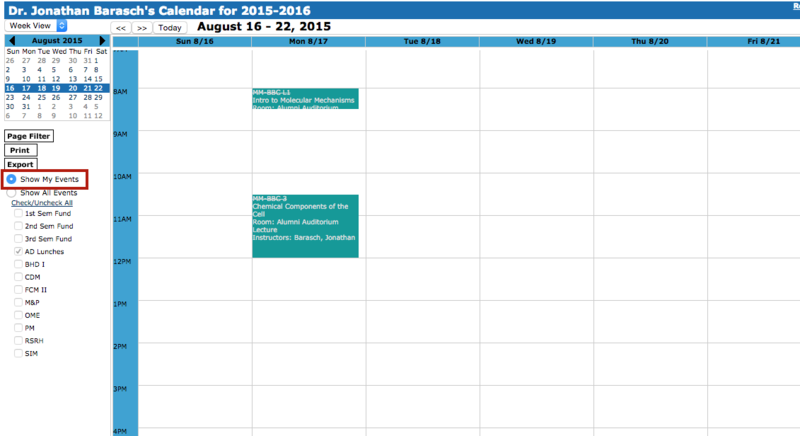 To access the calendar, click on Calendar on the OASIS toolbar. 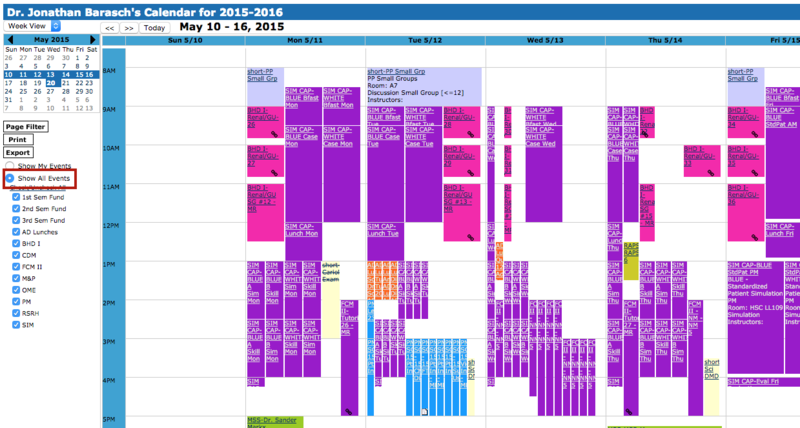 After you click on Calendar in the toolbar, you will be taken to the OASIS calendar. The default OASIS calendar view is My Events. 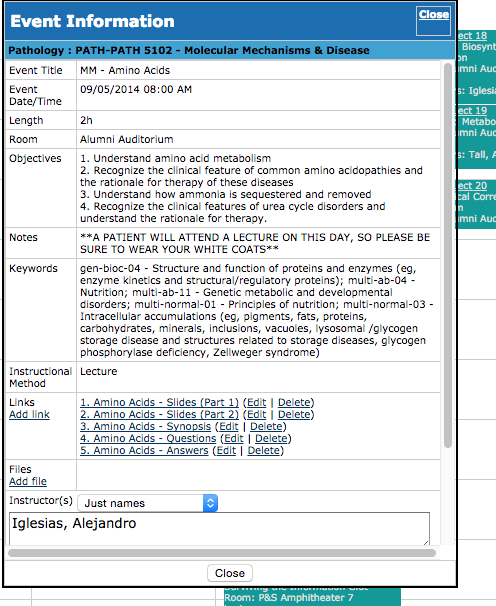 This calendar view will display on the calendar all events that you are assigned to as an instructor. You may want to view all of the events going on in a given week, or all of the events for a particular course or a student level. To change the calendar view, click the radio button next to Show All Events. This will display all of the events taking place in a given week. As you can see, however, this calendar view can be very cluttered. To make the calendar view more manageable, you will want to filter by Modules, which are listed beneath the Show All Events option. A module can represent a particular course (such as Molecular Mechanisms) or a student level (such as all of the course events taking place during the Second Semester of the Fundamentals phase). 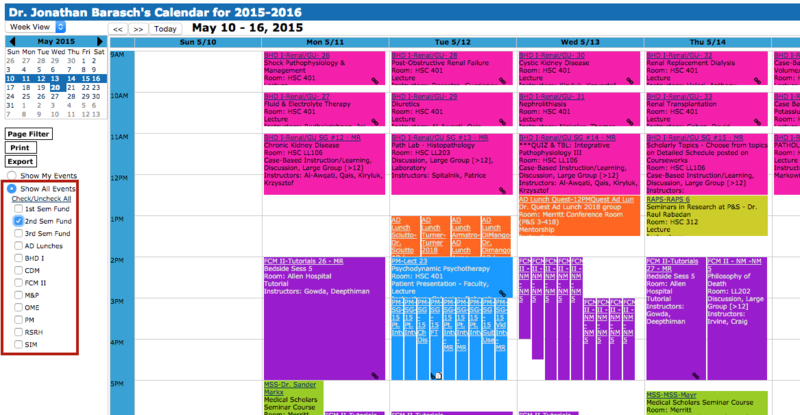 These modules can be turned off and on to modify the events that appear on the calendar. You can combine different Module filters, so that the calendar displays only the types of events that you need to see. Clicking on an event on the calendar will open an Event Information window. This window will contain essential information about a given event, such as its duration, location, and date. Course events will also contain information such as the instructor or instructors leading the event, the event objectives, the content keywords associated with the learning event, and any notes that the event's creator has added to the event. Beneath the list of instructors, you will also see the event roster, which contains the list of students assigned to the selected event. If you drop down the Just Names menu above the list of instructors and/or students, you will be able to select Email with names or Email without names. These options will display a list of email addresses for the event attendees that is properly formatted and can be copied and pasted into an email application. This is an efficient tool that can be used to quickly contact all of the participants in a given events without having to manually enter all of the recipients' email addresses.